Chita became famous when many of the Decembrists—a group of military officers who staged an unsuccessful rebellion in St. Petersburg against the tsar in December of 1825—were exiled to this distant outpost. On the long trip between Moscow and the Pacific Ocean, the Trans-Siberian Railroad trundles past Lake Baikal in Eastern Siberia and enters an obscure part of Russia called Transbaikalia. From the train window, you see the green mountains of the Yablonovy Range and river valleys dotted with an occasional hamlet of wooden houses. The ride through Transbaikalia is one of the most striking segments of the Trans-Siberian Railroad, yet few travellers stop to explore. The region’s capital city, Chita, is a great place to start. Daily flights run between Chita and Moscow ($650 roundtrip), but most travelers arrive in Chita by train. To the west, 4-5 trains leave the city of Ulan-Ude throughout the day and night (9-12 hours, $40-170). From the eastern city of Khabarovsk, three trains leave for Chita daily (40-42 hours, $100-240). From Chita you can hop trains south to China or east to Vladivostok. Chita is an ideal stopover point on a long train journey that boasts modern hotels and an intriguing revolutionary history. Chita is also within striking distance of remote wilderness and some of Siberia’s finest Buddhist temples. Chita is located just 500 kilometres north of China at the confluence of the Chita and Ingoda Rivers. Chita fell under Russian influence when Cossack explorer Pyotr Beketov established a camp here in 1653. When Beketov arrived, Transbaikalia was still part of China. In 1689, Russia and China signed the Treaty of Nerchinsk, which annexed Transbaikalia to Russia. One year later, a Russian fort was built where Chita now stands that expanded into a town when silver was discovered nearby. By 1860, China had ceded its northernmost territory to Russia, from Transbaikalia to the Pacific Ocean, and Chita became one of the last outposts before the new Russian Far East. Chita is also known as the ‘City of Exiles.’ Chita became famous when many of the Decembrists—a group of military officers who staged an unsuccessful rebellion in St. Petersburg against the tsar in December of 1825—were exiled to this distant city. The Decembrists hoped to abolish serfdom in Russia, and, despite their failure, they became national heroes. While in exile, they staged events like concerts and literary readings, and are often credited with bringing the best of European culture to Siberia. The Hotel Montblanc (Ul. Kostyushko-Grigorovicha 5) is a modern luxury hotel right near the central square. Basic rooms start at $100 a night. In the early 20th century, Chita became a hotbed of rebellion. During the brief Russian Revolution of 1905, socialists took over the city and established the new ‘Chita Republic’ which was soon crushed when Russian troops arrived in the winter of 1906. The Russian Revolution of 1917 caused a civil war between the Bolshevik Red Army and the insurgent White Army. During the war, Chita became capital of the Far Eastern Republic, a new buffer state between Soviet-controlled western Russia and anti-Bolshevik insurgents in the Far East. After the Red Army won the war in 1922, the Far Eastern Republic peacefully became part of the Soviet Union. During the Soviet days, a large number of military installations were located in and around Chita, and outsiders were not allowed to visit. Today, Chita is a great place to get off the tourist path and see some of the real Siberia. Lenin Square is the heart of Chita and a convenient starting point to explore the city. From the train station, the square is located just three blocks up Ulitsa Butina past Chita’s iconic turquoise cathedral. Surrounding Lenin Square are a number of shops and an enormous statue of Lenin. You can easily spend an entire day exploring Chita’s museums. The city’s Military Museum (Ul. Lenina 86) is right by Lenin Square. There you can view an impressive collection of weapons as well as decommissioned tanks. North of Lenin Square, you’ll find the Kuznetzov Regional Museum (Ul. Babushkina 113), which has comprehensive exhibits on the history of the surrounding country and the indigenous people who inhabited this rugged land before it became part of Russia. For Aficionados of Russian history, Chita’s Decembrist Museum (Ul. Dekabristov 3b) will be the highlight of your visit. This small museum is located in the Archangel Michael church, a log building constructed in1776 that is one of Chita’s oldest buildings. The Decembrists came to pray in this church during their exile in Chita. The museum inside houses detailed exhibits on each of their lives. 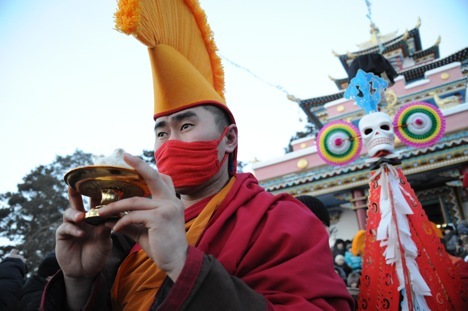 Chita is also close to a few impressive Buddhist temples where you can explore eastern Russia’s rich Asian heritage. The indigenous Buryat people who live throughout Transbaikalia and the nearby Buryat Republic are Buddhists, and a visit to their monasteries—known locally as datsans—is a requisite stop on any Siberian adventure. The Buryat town of Aginskoe is just two hours from Chita and has a local datsan that contains colorful temples with pagoda roofs that curl like old pieces of parchment. Southwest of Aginskoe, in the small town of Tsugol, you can visit the ornate Tsugol Datsan. Built in 1820, the Tsugol Datsan is a stunning, three-story wooden building which many consider to be the finest Buryat datsan in Russia. Getting to Aginskoe and Tsugol can be tricky. The Chita-based travel agency Rus Tur (Ul. Lenina 93, office 410) can help organize transport to the datsans in a private car ($250). Chita is also a jumping off point for remote forests and steppe that have traditionally been home to the Buryat people. The Alkhanay National Park, just east of Aginskoe, is one of the best places near Chita to get close to nature. The park features forested mountains, mineral springs, and several rock formations considered holy sites by Buddhists. The 14th Dalai Lama visited Alkhanay in 1991, and it’s not uncommon to see Buddhist pilgrims trekking in the park. Australia-based Russia Tour can help provide more information on arranging a trip to Alkhanay. Email: info@russiatour.com.au.